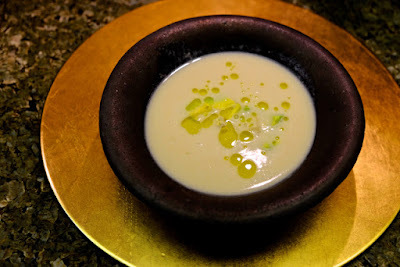 Four years ago, I posted my recipe for corn soup, which I had spent a lot of time developing. It is rich -- essence of corn -- despite the absence of anything but corn, a tiny bit of butter, a small amount of minced onion and a jalapeno pepper. Since then I have refined the recipe some and expanded the array of add-ins that I suggest in the note. In addition, I have experimented with using a pressure cooker and found that it is even richer due to the better extraction of flavor from the corn cobs that the superheated pressurized water permits. So here's the updated, improved recipe for my own corn soup. This is a perfect time to try it, with wonderful sweet corn abounding at farmers markets everywhere. 1. Put the most delicate ear aside. Take kernels off remaining 4 ears of corn. Cut the cobs into thirds. 2. Sauté onion and jalapeño in butter with a little salt until soft. Add corn kernels and sauté another minute or so, just to warm through. 4. Remove cobs and puree the soup with a hand or standing blender. (I use a blender because I like it very smooth, and the added corn will provide texture.) Taste and season with salt and pepper to taste. It may need a fair amount of salt to cut the natural corn sweetness. 5. Separately, bring a pot of water to a boil. Take off the heat, add the last cob of corn, cover and wait 7 minutes. (Or cook it however you like to make corn, including in the microwave.) Remove kernels. 6. Serve soup in individual bowls. Garnish with kernels from the last ear of corn, chives and a few drops of olive oil. Can be served cold or hot. If cold, chill and garnish just before serving. This soup is really easy to make and virtually impossible to screw up, especially if you start with farm-fresh corn.